Port wine traditionally comes from the Douro Valley in beautiful Northern Portugal. 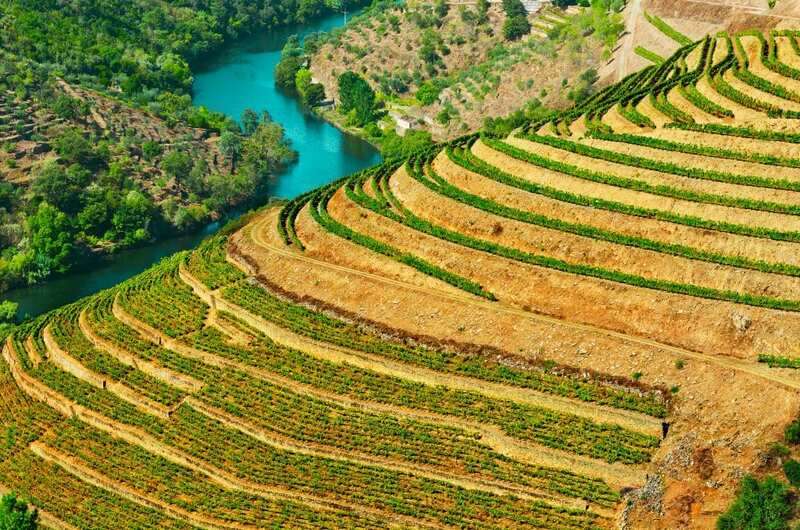 The wineries are called Quintas” and they line the terraced hills rising up from the Douro river, east of Oporto nearly reaching the border of Spain. The name “Port Wine” is protected by the Appellation system (Denomination of Origin), just as “Champagne” can only be placed on a bottle if it comes from the Champagne region of France. There are wine regions in the world producing Port-style wines (South Africa, California and Australia in particular), but they cannot use the name. This world-famous fortified wine first became popular when the English were at war with France during the Peninsular campaigns, and they stopped drinking French wines. This period in history gave the Portuguese a chance to launch their wines into the important British market. In the 18th century, however, the prices dropped due to market forces and the British accused the Portuguese of “doctoring” their wines. In order to protect their interests, the port farmers created an appellation system called Companhia Geral dos Vinhos do Alto Douro. This group was established by the Royal Charter in 1756. It began as a method of ensuring quality to balance production and trade as well as equalizing prices. In 1850 Phylloxera and oidium destroyed most of the vineyards in the previously demarcated regions. In 1865, a new trading administration began to open up the demarcation regions and to expand to the Upper Douro. Before the end of the century, new methods of viticulture and vinification were implemented- planting techniques, and regional selections for grafting, fertilizers and pest control use, as well as much more controlled wine-making procedures. With steep terraced hills, this region proved to be a rewarding challenge for British and Irish entrepreneurs in regards to wine production. In order to survive the long ocean travel, Brandy was added to the wines to give them longer shelf life and resist the temperature changes. Brandy is added to all port wines (20% of total volume) elongating shelf life and the fermentation process within the bottle. From this technique grew the new category of fortified wines, and Port is among the most famous. There are dozens of grape varieties that are permitted in Port wines (up to 80). The most common varieties being Touriga Nacional, Tinta Barroca, Tinta Roriz and Touriga Francesa. Port requires long oak aging and vintages are blended using the Solera method to keep a consistent taste. It is fortified and aged in the bottles. Port needs to be decanted and served in narrow wine glasses to keep the alcohol from overwhelming the flavors. It goes well with cheddar cheese and also with chocolate. It usually emits a black currant aroma with a peppery smokey aroma in its bouquet. Port has the capacity to age sublimely, Vintage Ports only peaking after 50 years of aging. 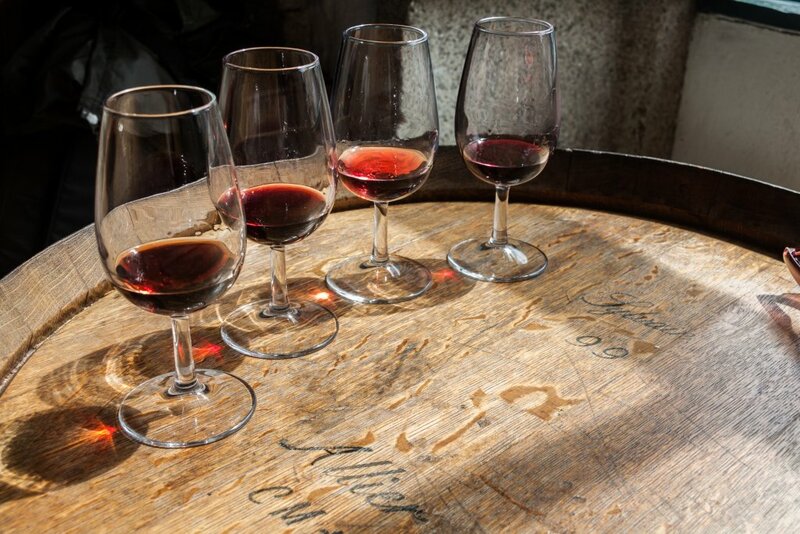 There are five basic types of port wine. Whites tend to be simple multi-vintage blends that range from sweet to dry. The ruby and orangey ports are also multi-vintage blends which are sweet and can be aged. Dated ports are the quality orange wines that are marketed by their age. Harvest ports are not blended and are aged for at least 7 years. The final type is the vintage ports. These are made from a single harvest and are of very high quality. 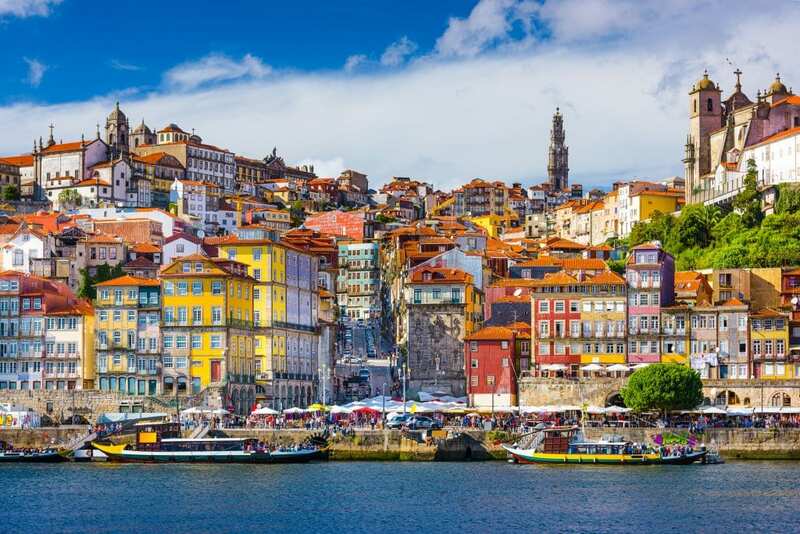 The Oporto region is located in Northeast Portugal, in the Douro River basin. It is completely surrounded by mountains giving the area a perfect and characteristic soil and climate. The Port region stretches over 250 000 hectares of land. It is divided into three very diverse sub-regions according to terroir- the Alto Douro, the Douro Superior, and the Cachao de Valeira canyon. After 1936 the Cachao de Valiera canyon split into two regions, The Baico Corgo and the Upper Corgo. Each year licenses are awarded by the officials according to the location, soil content, variety, and age of the vines used for each vineyard. They are classified then from A to F, with A being the highest priced. This is called the Beneficio system. This system helps keep quality and style of Port true to tradition and in high demand throughout the world. Port is a huge industry for Portugal (historically and now) and symbolizes Portugal to the rest of the world.